Claims to save energy of up to 35%, this electric dryer has a Moisture Sensor, a system that turns off the dryer automatically when a load is sensed as done. Allergens are taken care of by the unit's Allergen cycle, while harmful bacteria and germs are eliminated with the NSF-certified Sanitize high temperature option. The dryer's Ready Steam Technology releases steam to help keep fabrics smelling fresh and looking crease-free. Choose from its 13 dry and 4 specialty cycles for each garment type. The standard Normal cycle is meant for everyday clothes like shirts, while Towels/Bedding is for bulky items like blankets and bedspreads. To freshen up and iron out a cotton shirt, turn the dial to Steam Refresh, and press the Anti Static option to help prevent static cling. The dryer's 5 temperature levels range from a no-heat setting to very hot one. The no-heat drying is called Air Fluff, an option to dry your clothes by tumbling them without heat. Keep clothes free from up to 99.9% of bacteria with Sanitize option. This NSF-certified setting uses very high temperature to kill germs and bacteria. The stainless steel drum tumbles in approximately 50 rotations per minute. It is constructed with a lint filter and interior light. A drying rack can be installed but is sold separately. A small Time Remaining Indicator is fitted next to the dryer's Express-Select controls. The control panel includes a dial to set drying cycle, and buttons for options. The cycle and option menu is carefully labeled in English for easy programming. Right below the Express-Select controls, the dryer's round, transparent door is attached. It is reversible and can be made to open whichever way. This type of door comes handy for small laundry space. To save space, place the dryer on top of a matching washing machine with the help of an optional stacking kit. An optional 15-inch SpaceWise Drawer Pedestal is also available. Available colors are Classic Red, Classic Blue, Classic Silver and Classic White. 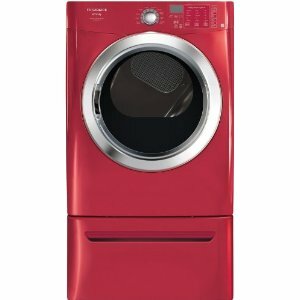 Programmed with 13 dry cycles and 4 dry options, the dryer offers more settings for different fabric type. The Ready Steam cycle cleans and refreshes clothes without washing. Static cling is prevented with the Anti Static option. The Moisture Sensor guarantees dry clothes. Almost noise-free operation with the SilentDesign Ultra technology. The Express-Select control panel is easy to use. With the Allergen cycle, allergy-causing particles are removed from clothes. The NSF-certified Sanitize option kills up to 99.9% of bacteria. The dryer has too many cycles and some offers the same features. The unit price does not include the drying rack. A 7.0 cubic feet drum is smaller compared with other 27 in. wide dryers.